J Dubb over at Five Four Clothing hit me with the flyer you see above. This is the second time they're bringing awareness of alternate transportation "to offset global warming." 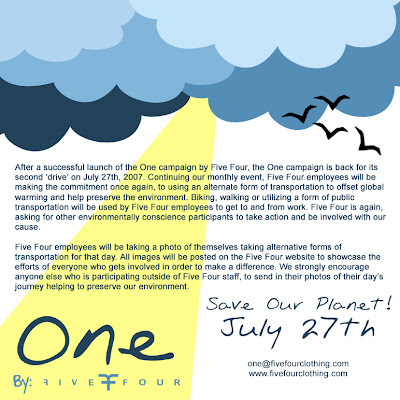 The employees of this fine company will be posting images of their efforts on their blog on Friday, July 27th and encourage you to participate in loving your mother earth as well!